Did Elvis play the Armadillo (when it was called the Sportcenter)? 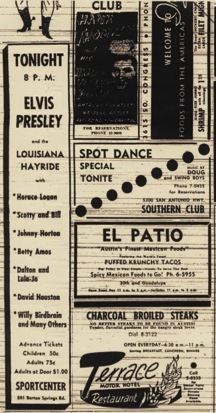 Elvis Presley played Austin four times before his Jan. 28, 1956 TV debut on the “Dorsey Brothers Stage Show.” First was March 17, 1955 at Dessau Hall, then Aug. 25 at the Sportcenter on Barton Springs Rd. He played the Skyline Club on Oct. 6, 1955 (after a matinee show at SWTSU in San Marcos) then opened for Hank Snow at the City Coliseum Jan. 18, 1956. I’m trying to find as much info as possible about the Sportcenter, which was at 501 Barton Springs Road, according to this Statesman ad, yet not listed at all in city directories of the Fifties. Eddie Wilson said the Sportcenter performances took place in the same space as the Armadillo World Headquarters. Here’s a link to more photos and history of the Sportcenter. This entry was posted on August 10, 2011 at 5:51 pm	and is filed under Music, Texas Music History. You can follow any responses to this entry through the RSS 2.0 feed. You can leave a response, or trackback from your own site.